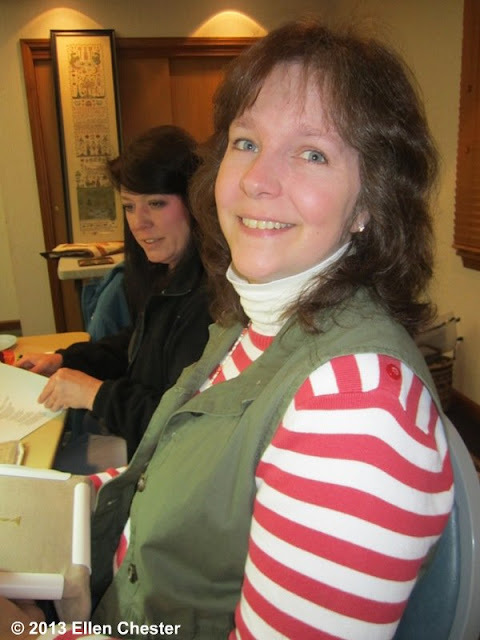 With My Needle: Samplers, Friends, and Hot Cross Buns...Oh My! Samplers, Friends, and Hot Cross Buns...Oh My! What a great Queen City Sampler Guild meeting we had on Saturday! We had a very good turn out of folks to hear Darlene Anderson from Omaha, Nebraska speak on Adam and Eve Samplers. 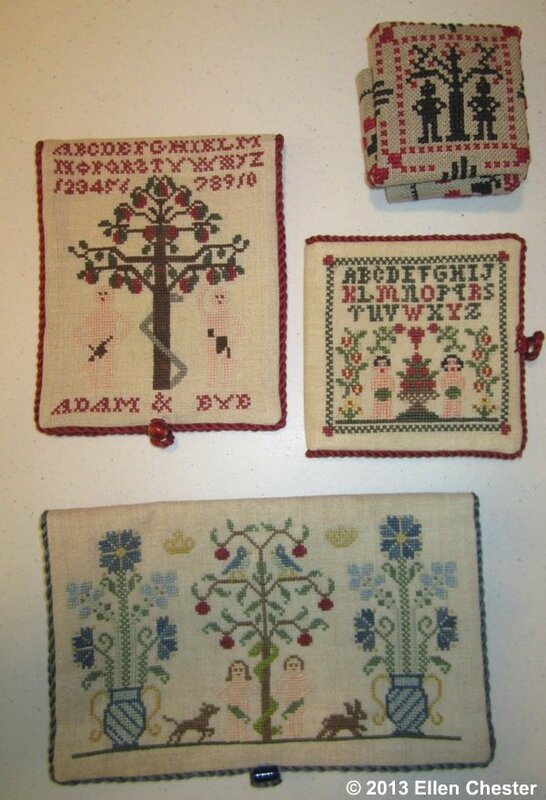 Darlene gave us a lot of background information and then showed us images of lots and lots of Adam and Eve samplers she had stitched. Most of the samplers were reproductions. 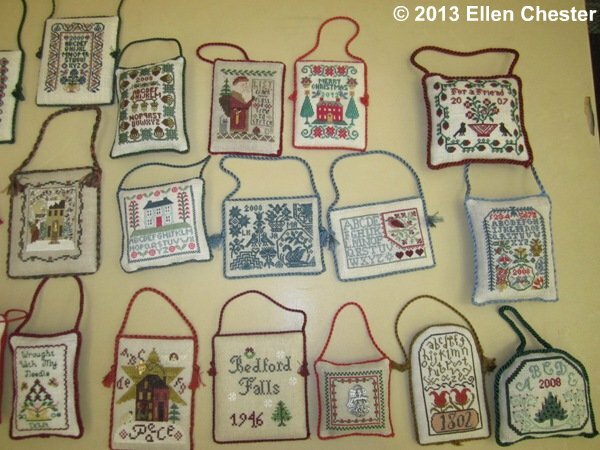 Darlene's ornaments are a combination of traditional Christmas ornaments and small samplers. I had never thought of stitching something non-Christmasy as an ornament, but I found the idea wonderful. Did you notice the cute little bags under the table? Darlene brought door prizes. 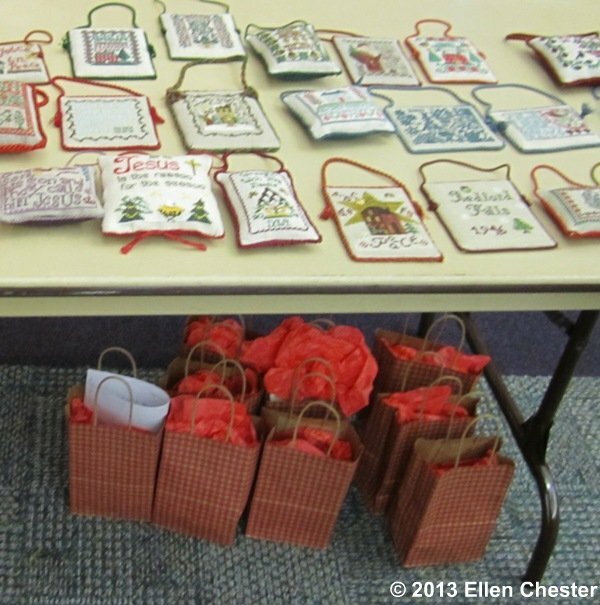 Each bag contained a different Adam and Eve sewing case that Darlene had stitched! WOW!! Inside each sewing case was a pair of scissors. We forgot until late in the day to have the lucky winners display their new treasure. Some members had left early, but here are four of the wonderful cases! Then it was time for lunch. 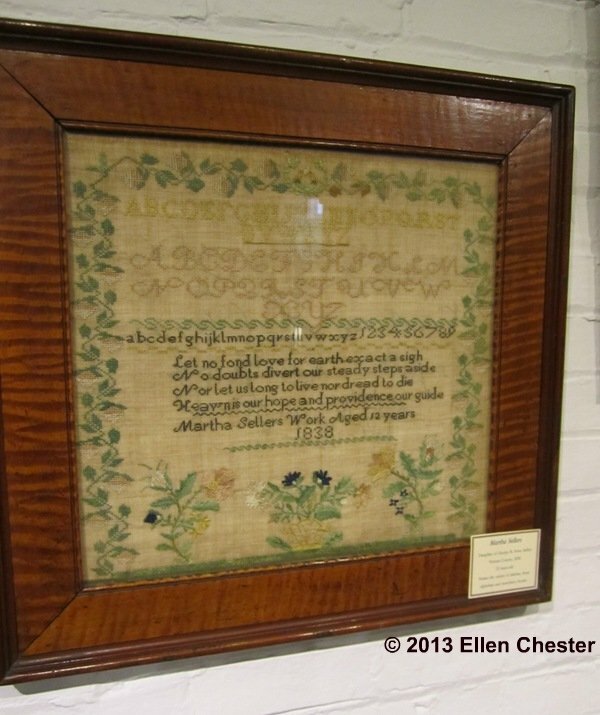 Thanks to Lisa (The Inspired Stitcher), I knew that there was a sampler exhibit nearby (only 5 miles away) at the Warren County Historical Society. Two car loads of us decided to check out the exhibit. It was impossible to get any good photos because of the lighting and the glass on the frames and display cases. I thought you might enjoy seeing some photos anyway. 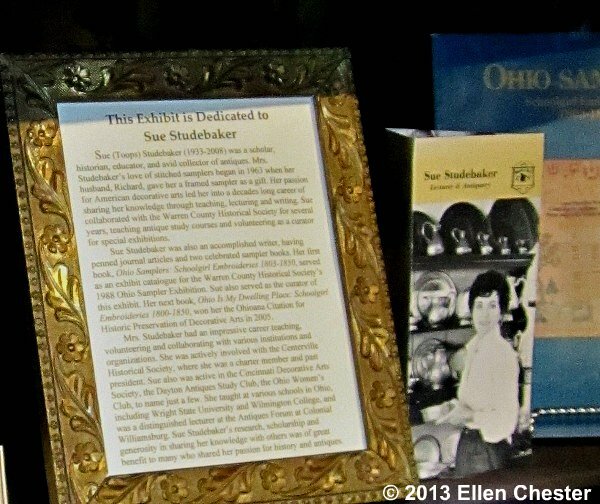 The exhibit is dedicated to the memory of Sue Studebaker, an expert on Ohio samplers and author of two books on the subject. It is hard to believe it's been over 5 years since Sue's most unexpected death. I saw copies of both of Sue's books in one of the exhibit showcases and in the museum gift shop. 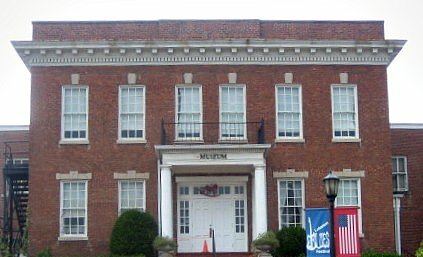 If you don't have them, you might want to give the museum a call. 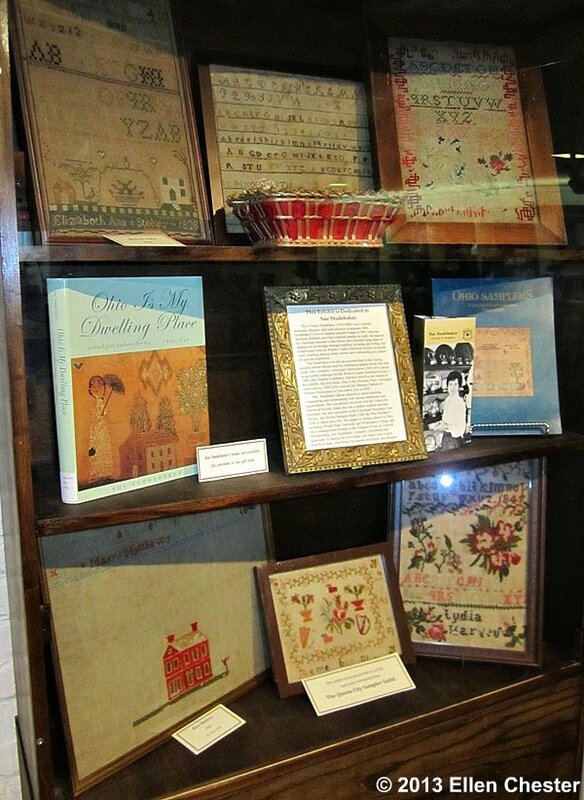 To read more about the exhibit and see more photos, check out Lisa's blog (The Inspired Stitcher)﻿. Of course, we also had some time to stitch. Here is Lisa. Want to see what she's stitching? I thought it was pretty cool that Lisa decided to stitch a piece with the same theme as our guild program. And then, before we knew it, the meeting was over. Afterwards, a few of us went out to dinner with Darlene. I couldn't resist showing you one more photo. This one is of hot cross buns at my church's Sunday coffee hour. It has become a tradition to have them on Palm Sunday. Don't they look yummy? What a treat you all had!!! So lovely! I finally figured out who Darlene is. 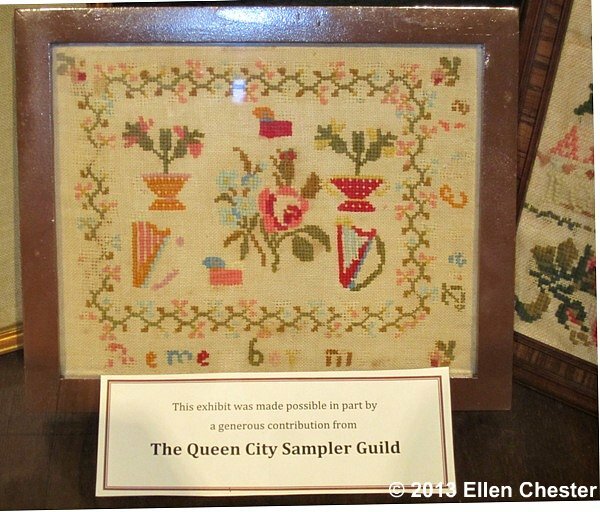 Paulette Stewart showed some of her samplers in her home once -- amazing!!! Thanks for sharing with us -- I loved it! And the museum exhibit is wonderful too! 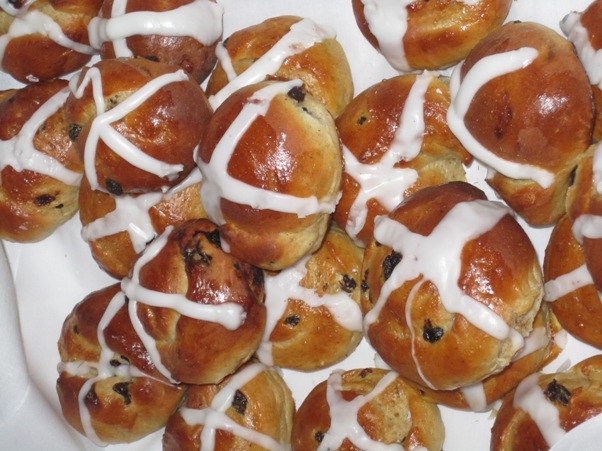 Those hot cross buns -- yum! Very beautiful samplers. I cannot believe all of the ornaments! 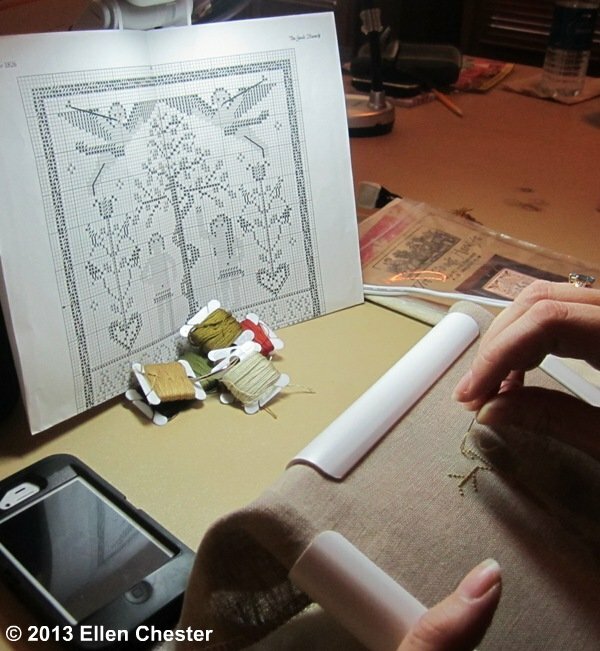 Can you tell us who is the designer of the Adam & Eve design Lisa is stitching? I don't think I have ever seen that one. 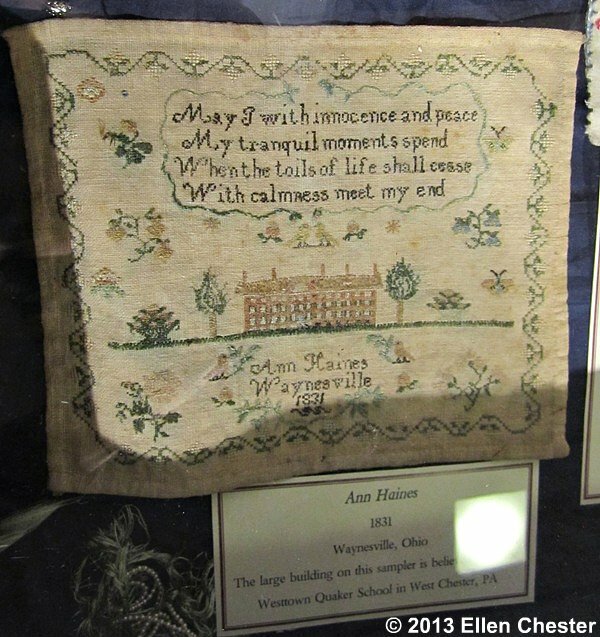 I would have loved to hear the talk about Adam and Eve samplers! I'll bet it was so interesting. And I can not believe all those ornaments. What a feast for the eyes! It looks like a delightful event and an amazing collection of ornaments! Like you, I'd never thought of a non-Christmas ornament but it really does work! Thanks for sharing all those beautiful samplers.What a fascinating meeting! Sounds like you had a fabulous day. Thanks for sharing the wonderful photos with us. 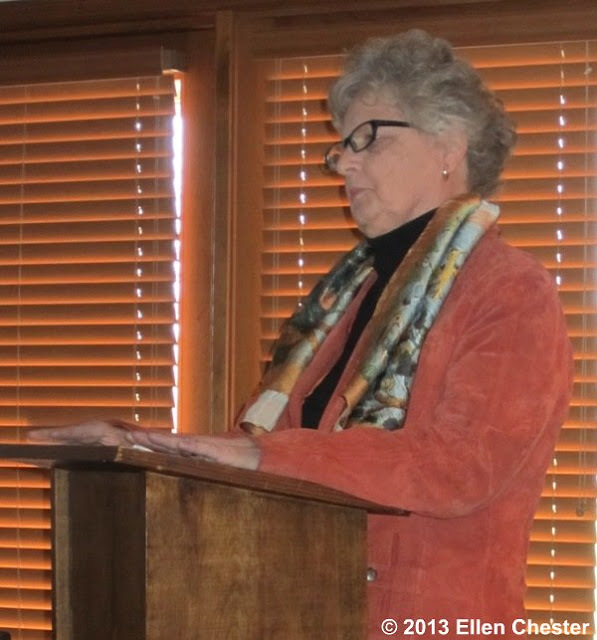 Ellen: Ronda came by the next day and told me what a good time Linda and she had at the Lecture. Viewing your blog was almost as good as being there and then the Museum photos, they were the icing on the cake. 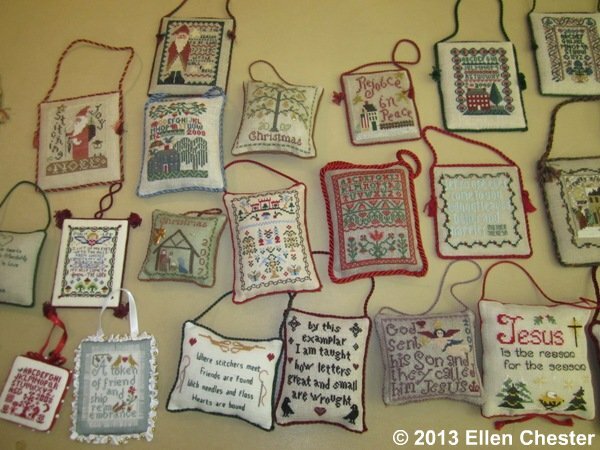 I've recently completed an intense sampler and after viewing the ornaments, I think that will be my next traveling project. To make as many ornaments as I can. What a great idea. Holy Toledo! That is one laaarge collection for one year!!!! 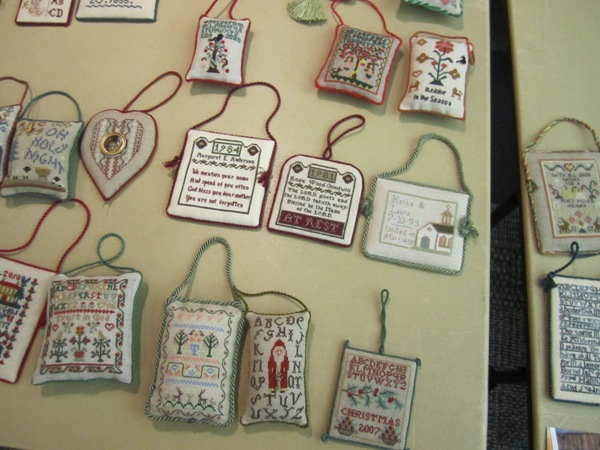 Sounds like a wonderful day, I am in awe of Darlene's stitching! Oh good you got to see the exhibit this time:) Fantastic meeting and such a great day for you. I do have Ohio Is My Dwelling Place book. It's a book to read cover to cover and lots of lovely photos of samplers. 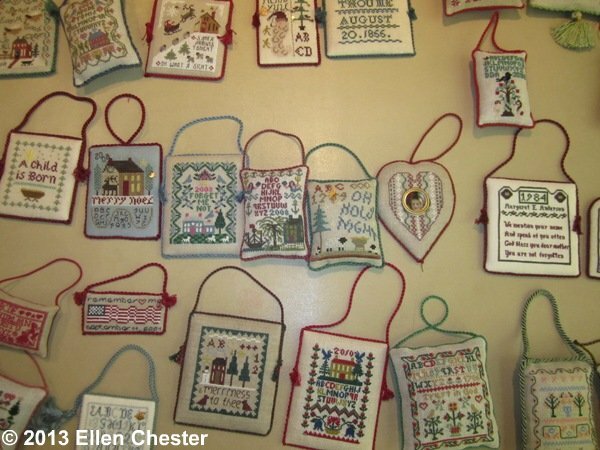 Darlene's collection of ornaments she stitched are treasures. what a fantastic day you had with your guild friends Ellen. Loved seeing the photos and hearing about everything you did. Great days like that are over in a flash.